“If you can’t beat ‘em, join ‘em”, has been around forever, but this is a little late in coming. It is so interesting that there are now at least three different versions of the silly yellow flier. Evidently someone scurried around after the first one and looked up the Tea Party core values. 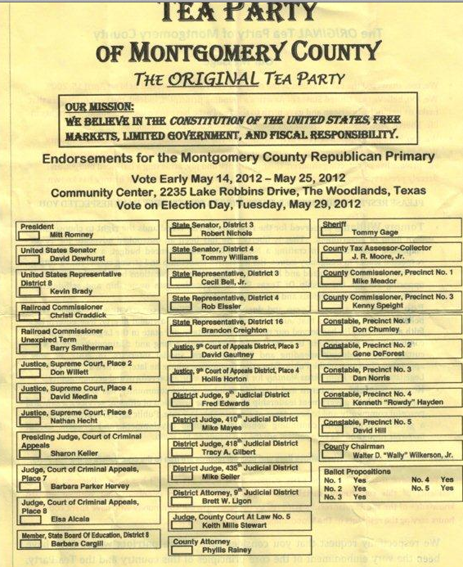 So the name on the ballot - “Original Tea Party of Montgomery County” – is an organization made up of people who have snickered at the Conservative and Tea Party movement for years, and then suddenly decided last week that they are now “original Tea Party members”? No names, no contact info, no phone numbers… that looks like… no truth. 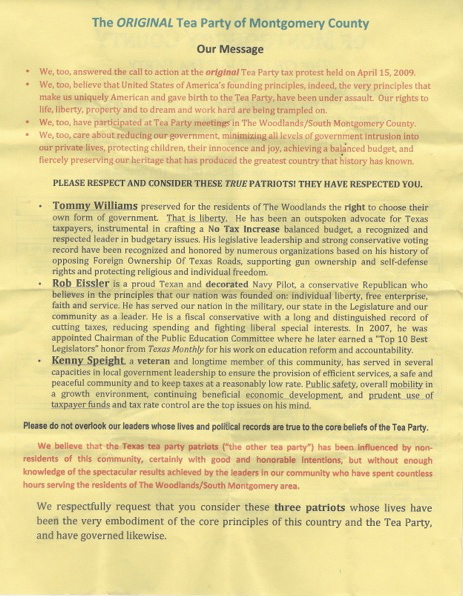 Texas Patriots PAC would be happy about this huge compliment if it did not have the potential for confusing voters. A real disservice to the community they say they want to serve.